The Karen State government is now making arrangements for the first return of 96 residents – 19 families – who have been living in refugee camps on the Thai border. The families are set to cross the Thai-Burma Friendship Bridge tomorrow. 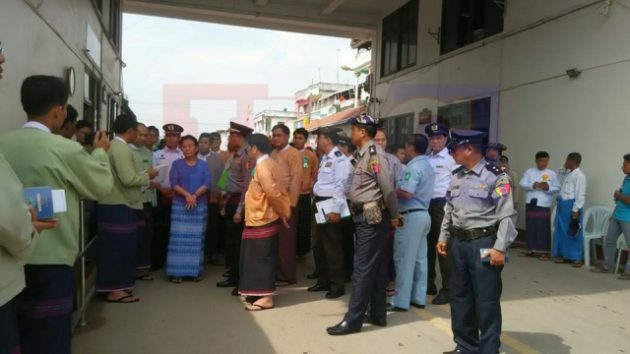 Nan Khin Htwe Myint, Chief Minister of Karen State on October 25, visited temporary accommodation for the returning refugees, in the Burma border town of Myawaddy to check the preparatory arrangments. According to sources from the Karen State government, the returnees are refugees who have voluntarily reported to officials in the camp about wanting to return to Burma. The issue was then picked up by officials from both countries started the process. It is reported that the majority of the returning refugee families are from the Nu Po refugee camp. The Karen Refugee Committee (KRC), who have been coordinating the management of the seven border refugee camps said that they have not been informed about this group of returnees, but as their policy has been that if refugees voluntarily decide to go back, they will not stop them. Naw Blooming Night Zan, a spokesperson for KRC told Karen News. State sources indicate that 17 families out of the 19 families will return on October 25 and that they will stay at a temporary camp in Myawaddy. A family from Chin State and a family from Magwe division will also be helped resettle by their respective Regional and State officials. U Zaw Min, the State directorate from the Social Welfare Department said that the families will reside in Myawaddy before moving to their new settlement site known as Lay Kay Kaw – a development project located on the southside of Myawaddy, when the site construction is completed. “The 17 families at present will stay in Myawaddy and when the houses that are being building for them finish, we will let them live in Lay Kay Kaw new town. The remaining two families from Chin state and Magwe region will be taken by their responsible officials from their state and region,” according to U Zaw Min. Sources from the state’s Social Welfare Department said that healthcare, education, social affairs and the refugee’s physical and mental needs will be taken care by UNICEF and the Save The Children. Discussion about the return of the 120,000 refugees from the Thai border camps has long been a talking point among various government agencies and the UNHCR, but this is the first time that both the Thai and Burmese governments have worked together to implement it.